In 2015, Guelph Hyundai retailed 673 new vehicles and 173 used vehicles and had revenue of about $31 million, AutoCanada said in the statement. 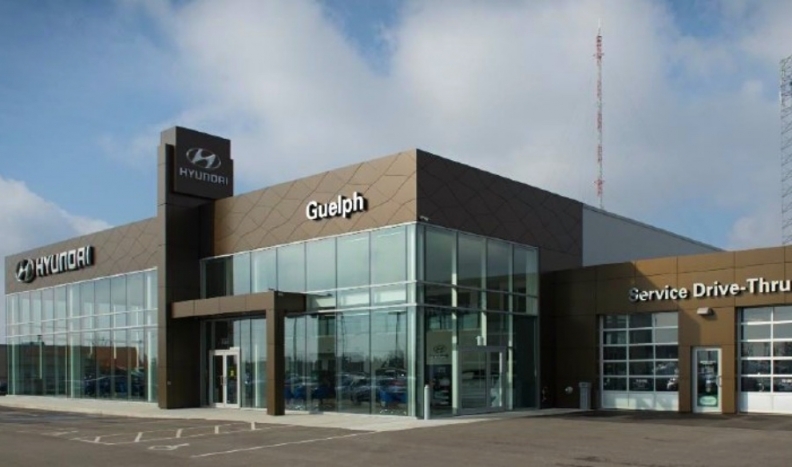 AutoCanada Inc. has purchased Guelph Hyundai in Ontario, giving Canada’s largest publicly traded dealership group added clout in the nation’s most populated province. The deal marks the second purchase of a Guelph dealership in the last two months and brings the Ontario total for the Edmonton-based group to eight. AutoCanada now has 57 dealerships and more than 3,700 employees in eight provinces. “AutoCanada is pleased to add to our cluster dealership model in the Guelph area and increase our business in Ontario," CEO Steven Landry said in a statement today. In October, AutoCanada bought Guelph’s Wellington Motors, a Fiat Chrysler dealership. Guelph Hyundai had been owned and operated by Graham Dennis. The store, built in 2014, was the first in Canada to use Hyundai’s “global dealership space identity,” designed to give Hyundai dealerships worldwide a unified look. The nearly 30,000-square-foot (2,800-square-metre) site has a 14-car showroom and 14 service bays. Dennis, who founded the dealership in 1984, has been running it with his wife. “We weren’t really looking to sell,” he said in a phone interview. But the couple had recently sold their cottage, which they also weren’t looking to sell, and bought an RV. Shortly after a long vacation in the RV, a representative the Canadian automotive recruitment agency Auto Careers Group asked Dennis if he was interested in selling the dealership. He wasn’t because they had just rebuilt the dealership in 2014. “It was designed for selling cars in the 21st Century,” he said. The Auto Careers Group rep suggested he could find a buyer that would pay now what the dealership would be worth in three to five years. “Lo and behold, we had six offers,” Dennis said, without disclosing a final sale price. AutoCanada didn’t indicate if the staff or roles at the dealership will change under the new ownership. The transaction is subject to customary closing conditions and approvals and is expected to close within 30 days. The purchase comes after AutoCanada posted declines in third-quarter revenue and profit. Revenue fell 3.6 per cent from a year earlier to $753.2 million, while gross profit dropped 4.5 per cent to $122.9 million. The results were affected by sales declines in two of the three Prairie provinces, AutoCanada said. Alberta sales through September were off 8.5 per cent, while demand in Saskatchewan slipped 6.6 per cent, said CFO Chris Burrows.